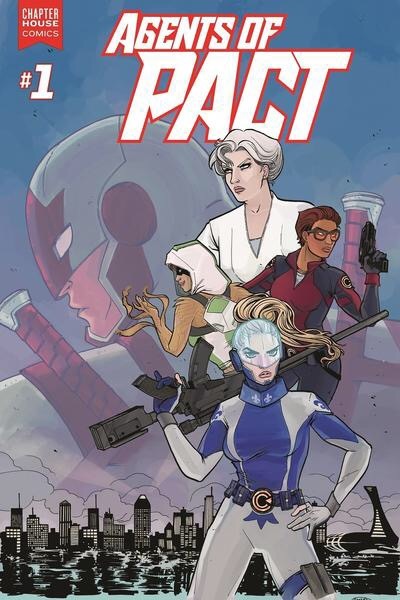 Many of the new Chapterhouse comics seem to be focussed on the narratives of men, so it is exciting to see that Agents of PACT is focussed on women. As a fan of the original Northguard comics by Mark Shainblum, I was extremely excited to see that Agents of PACT # 1 opened with the Northguard character Fleur de Lys. This flash from the past set the tone for the comic as one that is bringing back a golden age of Canadian comics, exploring figures from Canadian comic history and newly revised versions of these characters. Agents of PACT #1 interweaves narratives from Chapterhouse’s new Captain Canuck narrative with figures like Fleur de Lys, bringing in new narratives with characters that speak to a history of Canadian comics. Chapterhouse portrays a world on the edge of transition and change, with new powers arising in different people, organizations fighting over political power and the ability to shape the future, and the intrusions of further paranormal activity. This is also a comic about what it means to be a superhero, a question that is poignant for the Canadian comic book fan since frequently comic book historians like John Bell have suggested that Canadians are uncomfortable with the idea of the superhero, particularly given the superhero’s highly individualistic and self-aggrandizing nature. Marla is a character who has developed abilities to control liquid gold, but doing so causes her physical and emotional pain, and she is still trying to figure out what it means to be a superhero and if she, herself, counts as a superhero. Andrasofszky and Northcott draw on aspects of Mark Shainblum’s Northguard in producing a superhero who is self-critical and self-questioning, a character who invites questions about what it means to be a superhero. A review of Michael Johnstone’s “Missing in Action” in OnSpec # 105 Vol 28, No 2 (2017). Can a superhero retire? Is it the sort of lifestyle that can be surrendered? Michael Johnstone’s “Missing In Action” is a tale of a superhero who is experiencing PTSD (Post-traumatic Stress Disorder) after the murder of his son. He surrendered his position with the League of Canadian Heroes because every day on the job reminds him of his loss and re-traumatizes him. He has sought to keep his identity a secret, hiding from public life, and avoiding people who could recognize him, burying himself in a new civilian identity because he wants to be a normal human being. But the world isn’t that simple, and the cape and cowl aren’t as easy to give up as it seems. Jason Park can’t stand by and see a girl be abused by her father, especially since he is trying to excuse his abuse of his daughter on the fact that she is “a freak”. Johnstone brings out aspects of the superhero mythos that are under-represented. He asks what would happen if there were vigilante justice in a world where abuse continues to happen and police rarely do anything to stop it. He reminds the reader that the sort of experiences superheroes have are not ones that can be easily shrugged off and that there would be long term psychological consequences for loss, not a short hate spiral that only lasts the length of one comic issue. Johnstone’s “Missing in Action” is a story about complicating the superhero narrative, and taking it into areas that are less simple than good vs evil. A review of “Tesseracts Nineteen: Superhero Universe” Edited by Mark Shainblum and Claude Lalumiere (Edge, 2016). So often the superhero genre is treated as infantile, low brow, and therefore as un-valuable. Yet, the superhero has become our modern fairy tale, a transposition of the magical into the urban, replacing fairy godmothers with scientific experiments gone wrong. They still construct the brave princes and princesses facing off against the evil witches and corrupt kings – and they used to follow that simple binary of morality – good versus bad, hero versus villain. Yet, the most powerful way that superhero tales mirror fairy tales is through their adaptability, their ability to change, modify, and alter themselves to fit the concerns, issues, and ideas of each age for which they are re-written. Yet there is nothing simple about Tesseracts Nineteen: Superhero Universe. Lalumiere and Shainblum present us with morally complex superheroes, challenging the simple ideas of hero and villain. They share stories that complicate the figure of the superhero by presenting the wanna be superhero who ends up causing problems for the police, sharing tales of characters who literally reshape the comic tropes themselves, villains escaping to visit ailing grandparents, retired superheroes, superheroes who behave like villains, but the thing that all of these tales have in common are questions – interrogations of the genre and its tropes and opportunities for re-thinking the superhero for a new age. Superheroes are often portrayed as figures in masks and these masks allow them to be changeable, to play with identity and invite readers to question what lies beyond the facade. The authors in Tesseracts Nineteen challenge, question, and complicated the superhero while still presenting us with the tales we adore and have come to associate with the genre. As much as these heroes hide behind secret identities, there’s nothing more revealing than tights, and Tesseracts Nineteen reveals all of the potential within the superhero genre for thinking about our society in new ways through that lens of abstraction. 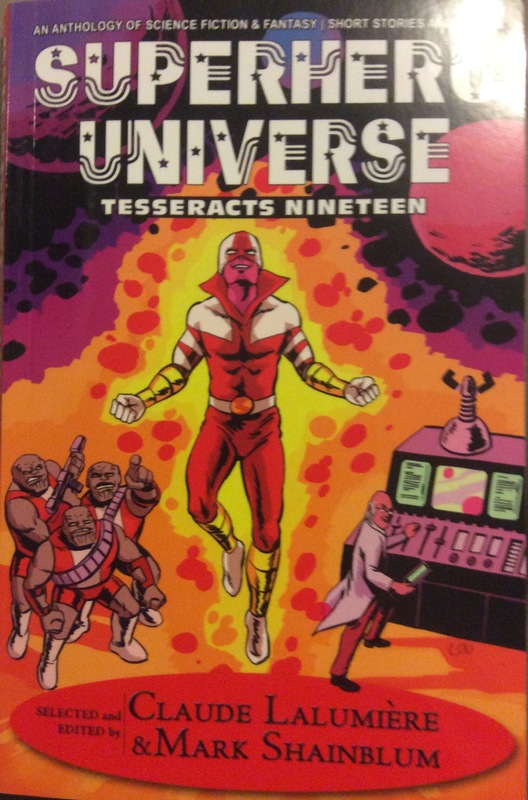 A review of Corey Redekop’s “SUPER” in Tesseracts Nineteen: Superhero Universe edited by Claude Lalumiere and Mark Shainblum (Edge, 2016). Corey Redekop’s “SUPER” intertwines the medical drama with the superheroic, creating a commentary on the medicalizing of bodies that differ from a socially created norm. “SUPER” presents the reader as one of a group of doctors who are being led into a facility whose purpose is to deal with medical issues that may arise from superhero bodies. The reader is led through an introduction to the facilities and some of the specific concerns that relate to super bodies. Redekop, although playing with humour and the absurd, also plays with the hyper-real by examining the potential realities of the diverse bodies presented in traditional superhero comics from the problematic digestive issues of a body made of stone, what happens when a super body heals too much and produces new bodies out of every discarded part, and what happens when an elastic body stretches too far. He also invites questions around those issues not explored in comics like what happens when a superhero acquires an STI or how superheroes cope with erectile dysfunction. Redekop plays with medicalised rhetoric around disability by instead applying this to superhero bodies, bringing attention to the ways that we socially construct disability as a problem. He uses medical rhetoric like calling people “supercapables” (playing with the term ‘handicapables’) to point at the way that language often is used as a distraction from deeper social discriminations against people with different bodies. He brings attention to the way that rhetoric often replaces real social change and nifty acronyms replace accessibility. Indeed, the facility itself is called SUPER (Sanatorium for the Uberhuman Palliative, Emergency, and Restorative care), playing with the way that medical bureaucracies often apply language to new situations instead of policies of change. Bringing attention to things like palliative care and terms like “restorative”, and “sanitorium”, Redekop focuses the reader on the institutionalization of people with disabilities and the aged. He invites the question of “what happens when we no longer consider different bodies to be USEFUL bodies?”, a question that has occupied disability scholars regarding the representation of disabled bodies as only valuable when perceived as productive. Redekop reverses the lens of looking at disability as the Other by also ensuring that the doctors are from traditionally pathologised groups, made up of people who exhibit borderline personality disorders and “near-crippling” social phobias. The doctors would likely be treated as stigmatized people because of their psychological disabilities and be subject to all of the social oppression that other people labelled “mad” would experience. By situating the doctors as people with stigmas, Redekop breaks down the barrier that is arbitrarily created between able-bodied and disabled, or, in this case, between able-bodied and superable-bodied. He portrays the psychological disabilities of these doctors as assets, aiding in their ability to think up new medical treatments. By putting the reader into the position of one of the doctors through the second person narration, Redekop further complicates the portrayal of disability by having the reader occupy a diagnostic position, making the reader the medical authority who is learning about new bodies. Combining social critique and questions with his characteristic humour, Corey Redekop wields his words like a scalpel, cutting to the root of complex social questions and operating in a theatre of critical wit.